Design in Life: the iPhone (pt II) — AS RAKESTRAW - The personal site of Alex Rakestraw. AS RAKESTRAW | The personal site of Alex Rakestraw. For all the revolutionary aspects of the original iPhone, it is impossible to avoid that parts of its hardware were disparagingly old for its price tag and generation. 2G data was no longer the industry standard. 4GB of fixed internal memory was pitiful compared to microSD-capable Blackberry and HTC competitors that could eventually support up to 32GB on interchangeable cards. At its release, iPhone was paradoxically ahead of its time and significantly behind the current technology. It would take close to a year before a 3G iPhone was released. By then, competitors had once again jumped ahead hardware-wise and the “catch up” cycle restarted. While the 3GS, 4, and 4S (alongside the 2011 expansion of iPhone service to Verizon Wireless) are arguably the phones that made iPhone the industry titan it is, in my opinion, the iPhone 5 represents the pinnacle of Apple’s smartphone design. For starters, let’s judge a book by its cover: the iPhone 5 is a gorgeous device. It is the first dramatic re-proportioning of the iPhone and represents a big risk for Apple circa 2012. The squat iPhone 3G hd a 0.53 aspect ratio; the iPhone 4 bumped that ever-so-slightly to an even 0.50, even though the phone’s overall height remained unchanged. The iPhone 5, however, broke far away from the norm with its 0.47 aspect ratio and increased overall height of .33 inches. The increased length gives the phone both an elegant profile and sense of delicacy compared to its stocky genealogy. This is all done to extend the iPhone’s standard 3.5 inch screen for the first time since the original device. Is it groundbreaking? Not exactly. But it is noticeable, and provides for just that much more content on screen at once. The iPhone 5 is also shockingly lightweight. At just 112 grams (a weight savings of 20% compared to the 4’s 137 grams), the 5 is a feather. It won’t make you noticeably more agile or change the way you handle the phone, but you know what – it’s nice. Once you’ve handled the 5, any of its cousins just feel bloated. On top of it all, the fit and finish of the device’s manual components is astounding. Buttons are placed exactly where you’d expect them to from experience with previous iDevices, but there is a superb attention to detail and styling within that placement. The home button’s classic “rectangle within a circle” design shares the centerline with a thin horizontal speaker and unobtrusive front-facing camera. Both the lock button and the volume control keys have a satisfying travel and impact without feeling clunky, yet are sturdy enough to feel like it would take extraordinary impact to dislodge them from their tracks. The screen is set into the all-aluminum body (both a durability improvement and a means of saving weight, similar to the Macbook) of the phone by a beveled edge, almost like a fine watch. Turning the phone over, a laser-etched Apple logo stands firm against a subtly two-toned rear case. The culmination of this all is the phone’s inherent beauty when compared to its contemporaries. Compare the above in purely aesthetic terms: proportion, balance, elegance, subtlety, and harmony between elements. I am a firm believer that there is such a thing as timeless design – forms that are free of tack, bloat, and novelty for novelty’s sake. A Dreyfuss telephone is just as relevant and beautiful today as it was in the 1950’s because of its streamlined, no frills design that also considered aesthetic elements during its creation. There is an element of this immortality present in the iPhone 5. The Dreyfuss Model 3 telephone shown next to promotional photos of the Apple iPhone 5. With superfluous looks out of the way, let’s dive into functionality. Forms that function take on another aesthetic value all their own. According to University of Michigan professor emeritus Allen Samuels, a prolific industrial designer with experience designing everything from locomotives to kitchenware, “there is beauty in informed utility… things are wonderful because they serve you.” The iPhone 5 embodies Apple’s empathetic philosophy by creating an entire consumer experience based on intuitive controls, both manual and digital. iPhone 5 schematics. Note the intricacy of the spacing between buttons. Manually, the iPhone 5’s buttons and switches have all been laid out in a way that allows the user to control all the phone’s essential functions and remain perfectly balanced in the user’s hand, even as fingers shift to cover different buttons. This is 100% intentional – your “natural” grip for an iPhone is informed by your prior experiences with objects of around the same size and weight. The recently-released iPhone 6 is MASSIVE as to be almost uncomfortable when placed in a pocket or held by smaller hands. I believe Apple got the iPhone’s form correct with the iPhone 5. Professor Samuels again: “Human psychology hasn’t changed that much since prehistory. There have always been forms that inform. Take for example, an archaeological hand axe: there are visual cues that tell you ‘this is the top, this is the bottom’ and lead you intuitively to its optimal usage.” The Home button is one of those: it is shaped for your thumb tip and placed at a comfortable distance from the phone’s edge when holding the iPhone in a usable position. That comfort is achieve through another facet of the iPhone 5’s incredible design – its interior. Interior components are arranged so that weight is evenly distributed over the phone’s body. This means a predictable weight regardless of hand position, allowing for the iPhone to be comfortable and stable in nearly any position. In addition, the phone’s rounded unibody means no edges or protruding elements that might cause the phone to snag on clothing when taken out. Think of what all the preceding means for the classic “phone flip draw” technique: a seamless user experience as you idly produce your phone walking between classes. Then, there are the digital controls – the successive iOS updates supported by the iPhone 5 available over its lifespan. The original iPhone 5 shipped with iOS 6, which brought a host of usability and aesthetic updates to the iPhone over iOS 5. More intuitive, swiped-based phone controls, a refined Siri voice search feature, and a more comprehensive Safari expericne are both highlights. Stylistically, little changed. The high-tech polish of iOS 5 remained, and lens flare abounded on nearly every app icon available. Initially, reviewers complained that too little had changed to necessitate a full-on title update. Then along came iOS 7.
iOS 7 represents a bold step forward both functionally and aesthetically. 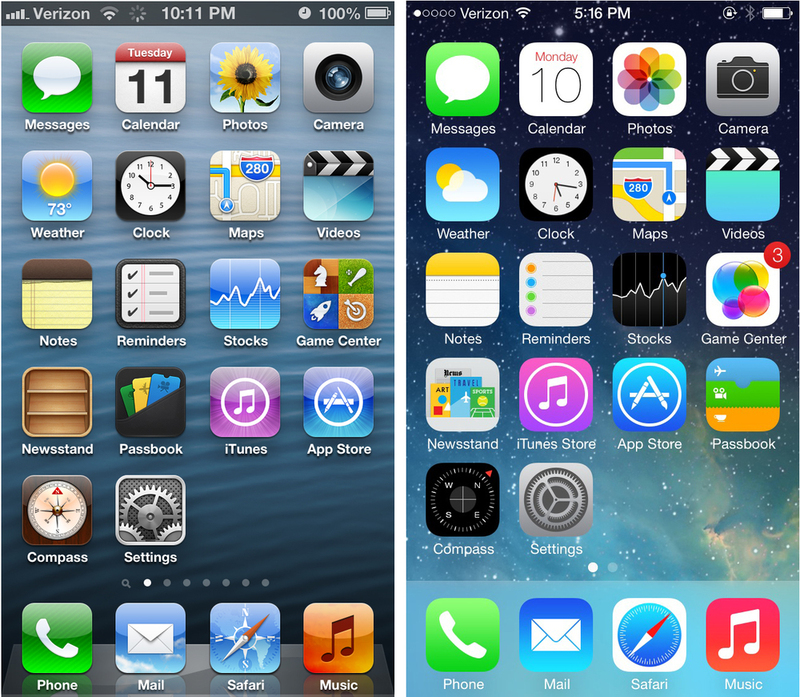 Apple intentionally designed iOS 7 to strip away the over-stylizing elements it believed plagued iOS 6, and as a result, iOS 7 bleeds minimalism. App icons are simplified, flattened, and often contain only a handful of high contrast colors. Device menus place emphasis entirely on visual components (most noticeably, the icon-heavy Control Center which is simply “swiped up” at any time to grant access to essential phone features like wireless). You know that the picture of an airplane means “Airplane Mode”, or that the flashlight is probably – you guessed it – a flashlight. You don’t need obtrusive text labels telling you that. The multitasking pane has also gone intuitive compared to iOS 6: open apps are swiped away to close, and the only text visible within the pane takes on the same size and shape under the app icon that it would on the home screen. And finally, the one feature you’ll undoubtedly be seeing dozens of times a day, the Lock Screen, received a complete design overhaul: it is no longer in grid form, and instead is made of free-floating circles (about the size and shape of your thumb tip) arranged like a numpad. Large, clear, elegant numbers occupy space inside each, and circles have enough empty space between to discourage misinterpreted presses. Apple’s message is clear: if you’re gonna use the same screen thousands of time, it has to work right – but it might as well look good doing it. That’s all well and good, but what does it mean for the average Michigan student? Simply put, it makes the most advanced consumer-available communications technology ever developed as easy to use as a stone tool. Sending millions of bits of Rick’s Thursday Snapchat selfies over airwaves up to a satellite and back down to a moving target halfway across the country obviously requires incredibly complex wireless infrastructure outside of a handset – but at the point of interaction, millions of man-hours have gone into creating a user experience as comfortable and usable as possible to harness that dizzying potential. Wrapping all of that in an elegant exterior? That’s no small feat, either. The iPhone 5 (especially paired with iOS 7) enables everyone from the elderly to bored students, business travelers to Saturday night partygoers to seamlessly connect with the world at large regardless of their experience or current ability. It is democratic, beautiful, and exceptionally well designed. For that and all the rest of the above, the iPhone 5 is magnificent.